Unfortunately for too many, the experience of homelessness involves police encounters, lockups, courts, or jail and prison cells as much as it does shelter beds. Some people are caught in a revolving door between the streets or shelters and jails, not to mention other institutional settings. According to the United States Interagency Council on Homelessness, national data shows that the number of Americans caught in this cycle may number in the tens of thousands. Of the 11 million people detained or incarcerated in jails every year nationally, as many as 15% report having been homeless. Roughly 48,000 people entering shelters every year are coming nearly directly from prisons or jails. This issue is not foreign to the Connecticut homelessness system. A Yale Law School study claims that in Connecticut, homelessness is criminalized and that many experiencing homelessness are forced into breaking the law. 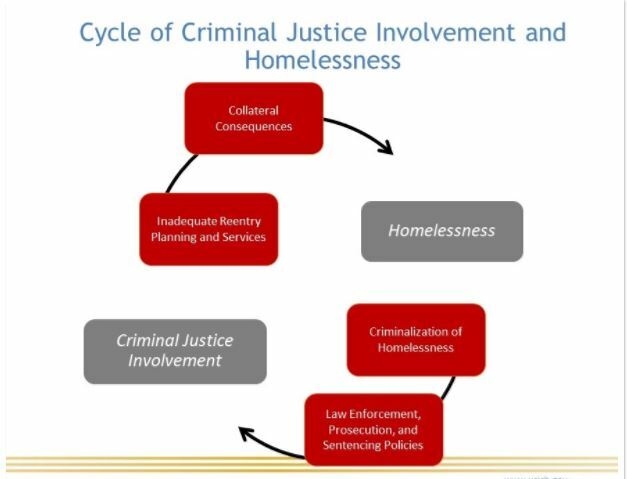 The study explains that laws that restrict behaviors in which people experiencing homelessness must engage to survive, as well as the practices used to enforce these laws, constitute what the report refers to as “making homelessness a crime” or “the criminalization of homelessness.” For many who are not homeless prior to entering the criminal justice system, many will enter homelessness following release from jail or prison. Many have no place to go upon release. They lack resources due to losing touch with family or friends, as a result of long-term incarceration, and due to burning all of their bridges. Many are denied services and resources due to their criminal record. Some who have places to live face policies or practices, including restrictions on access to subsidized housing, that either inadvertently or intentionally eliminate these options. Fortunately, the Connecticut Coalition to End Homelessness recognizes this issue and has begun to work on addressing many of the obstacles to housing people involved in the criminal justice system face in addition to working with Court Support Services on shelter diversion and understanding coordinated access. Also, the Connecticut Coalition to End Homelessness co-leads the Criminal Justice Task Force, a committee that is committed to addressing homelessness among those involved in the criminal justice system. Not only will streamlining housing resources to this population address homelessness among some of our most vulnerable people, but it will also reduce recidivism, contributing to overall safer communities.